Happy Ink Day everyone! Since I didn’t talk much about the page on Monday (Daisy is a much cuter subject anyway) I’ll cover the inks and coloring of page 09 now. Besides Casanova punching out the paparazzi on page 05 this was my first big action page of the issue so I was very excited about it. Ever since I designed the Hip Squad I couldn’t wait until someone got to punch them! My goal was to create the most annoying and stereotypical hipsters ever that you just want to punch in the face just by looking at them. I hope people to cheer every time one of them get smacked. This issue has just been one giant soapbox for me to rant about hipsters with the goal that I’ve made the Hip Squad such mainstream hipsters than even true hipsters will hate them for ruining their cause (whatever that may be). Piers is really the voice of the Hip Squad and he is a ton of fun to write due to him being such a hypocrite that everything he says is a lie but he believes it. 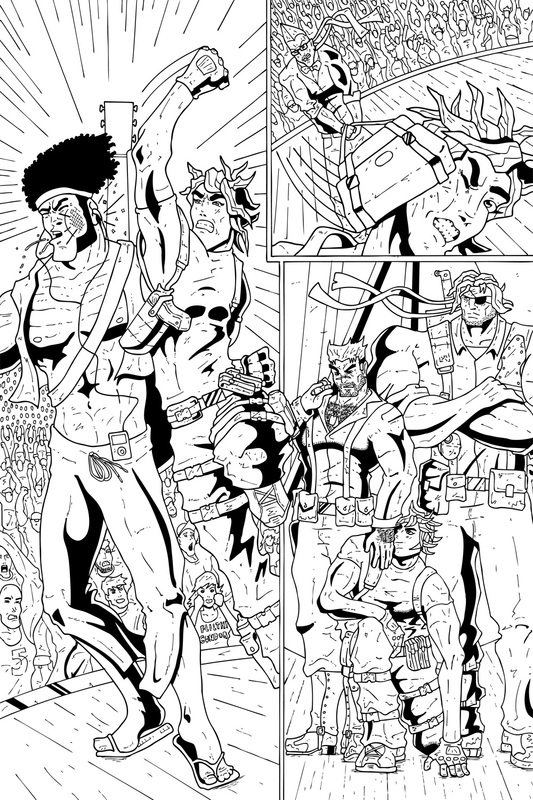 Have a great new comics day everyone and come back on Friday to see the pencils of page 09!